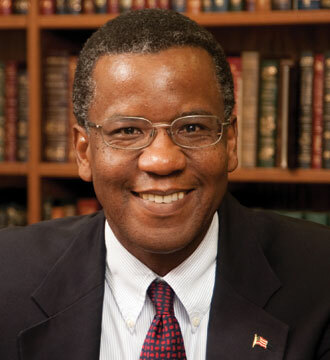 Professor Reginald Robinson has been honored by Ingram's magazine, which selected him for its 2014 list of "50 Kansans You Should Know." Among the people on the Kansas City magazine’s list are restaurateurs, a polymer researcher, a Master of Wine and Master Sommelier, non-profit leaders, an astronaut, a crop consultant, a hunting enthusiast and dog trainer, and multiple entrepreneurs. While Robinson is the only professor on the list, he is joined by others in academia like college presidents, coaches, and an athletic director. A recurring characteristic of these notable people is determination. Whether they have inherited a family farm or business, or have been in the corporate world or public sector, these men and women have each taken the path less traveled. They have dedicated themselves to activities that have strengthened Kansas and Kansans. For a man whose childhood was spent with his Army family living many places throughout the world, Robinson’s roots are firmly grounded in Kansas. His latter childhood years were spent in Salina, Kan. After college, several positions in federal government gave Robinson the experience of living in Washington, D.C.
"Although wonderful opportunities have pulled me away from the state from time to time, I’ve always been excited about coming home to Kansas," Robinson expressed. Back in Kansas, Robinson worked for the University of Kansas and served as president and CEO of the Kansas Board of Regents. He was appointed to both the Kansas Children's Cabinet and the Kansas Advisory Group on Juvenile Justice and Delinquency Prevention by Governor Bill Graves. Robinson is a professor of law and director of the Center for Law and Government at Washburn University School of Law. "As I reflect on my early days in the state as a Salina teenager and then as a college student, I’m grateful that the experience of living and learning in Kansas has nurtured the values and provided the tools that have served as the foundation for effectively engaging the opportunities I’ve been privileged to enjoy," added Robinson. “There is a wonderful 'grounding' that comes from life in Kansas; that 'grounding' has been invaluable for me, and I know that’s true for other Kansans as well."